Simple instructions that allowed for the ultimate prerogative to throw off any and all restraint and let the design reveal itself on the canvas. 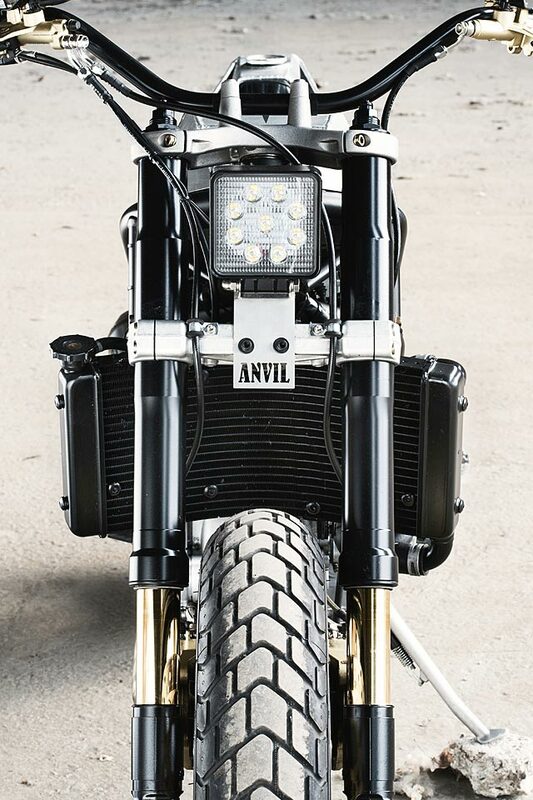 Two things they knew they wanted to achieve were to move past “classic” motorcycle shapes and create a clear divergence from past Anvil builds. 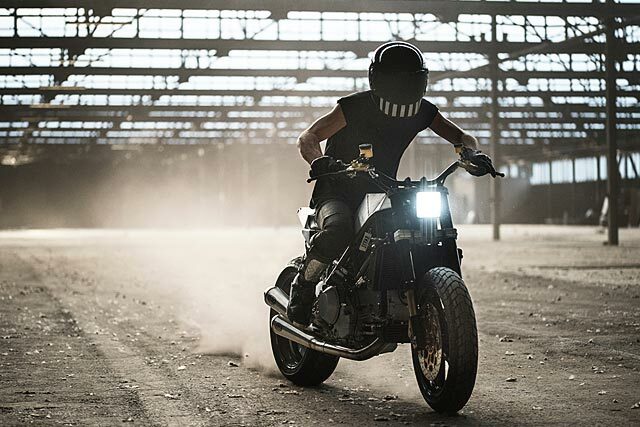 But first they had to strip the Monster down to its skeleton; the signature tank, comfortable seat, classic headlight and fairing all gone and left lying on the floor till just the steel trellis chassis and angry L-twin motor remained. 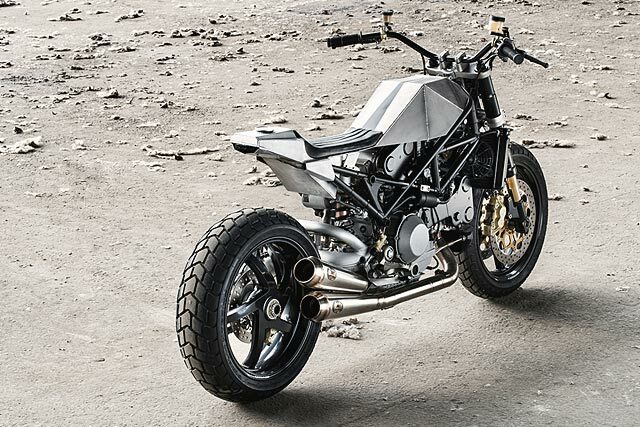 From here the signature Ducati frame, its lines and angles, those scalene triangle shapes would heavily influence the path forward. 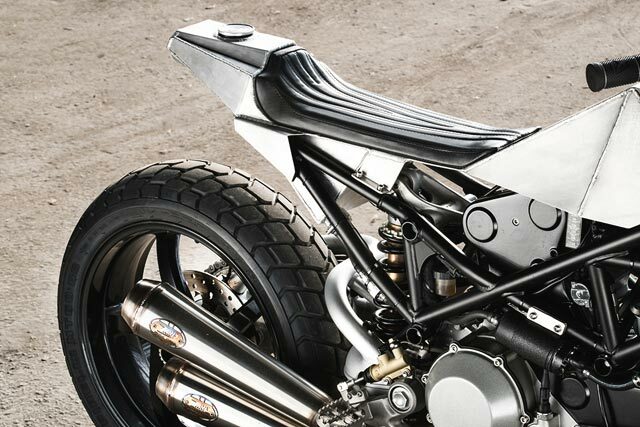 Working with Officine Italiane Zard on a number of components of the bike the most drastic change comes from the bodywork that totally transforms the Ducati from smooth lined machine into sharp-edged fighter. 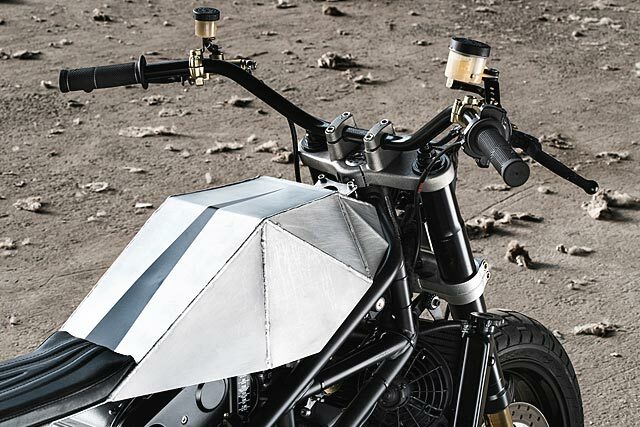 The fuel tank is in fact just a cover for the air box and while at first it might seem thrown together if you look closely you’ll notice the very deliberate lines. Untold hours went into crafting the sharp edges that still allow the tank to follow the curved lines of the frame, the angles in the tank piece mimicking those of the trellis and the welds left raised like brush strokes on an oil painting. The single piece body work neatly transitions down into the seat base where extra supports are welded in to meet the chassis. Before following the lines of the frame rearward, wrapping around the final edges to create a signature tail piece to match the tank. It’s here that the fuel is actually stored with a neat alloy fuel cell crafted to sit under the seat with the filler cap on top of the tail. Being a fuel injected engine this required lines to be run rearward and a blacked out external pump gets the juices flowing without compromising the limited internal capacity. “The saddle is in black leather, from old sports seats, we made it more slender thanks to the tapered stitches, mirrored in the black colour graphics that decorate the tank,” the Anvil lads affinity for matte black and classic leather still a part of this new style of bike building. 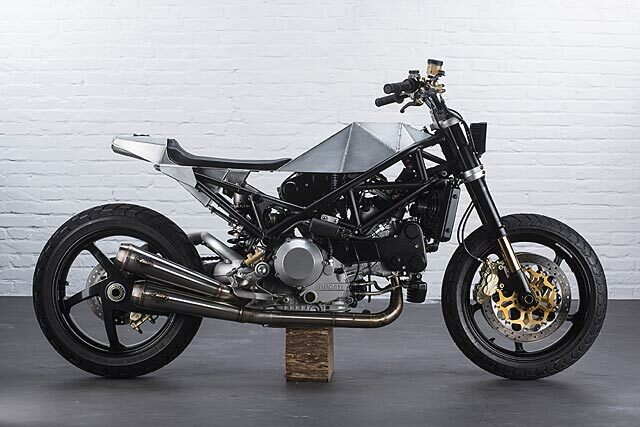 Their classic contrast of raw metal and the dark hue isn’t lost either with the frame given a fresh black coat and the gorgeous Ducati tubular single sided swingarm taken back to bare metal. That theme is meticulously maintained throughout, with the square LED headlight and its mount a mix and match of the two distinct looks. The suspension also gets the treatment; the impressive USD Showa forks were totally disassembled and rebuilt for the job. The triple clamps have had their paint stripped and then media blasted to give more of that worn metal feel, while the legs were painted black and the stanchions given a hardened gold to match the braking hardware. All of which comes in the form of totally overhauled Brembo components, 320mm discs on the front with four piston calipers and a two piston caliper doing the job out back. Lightweight Marchesini wheels deliver in the quality stakes and the exceptional Pirelli MT06RS rubber provides superbike like grip on just about any surface. 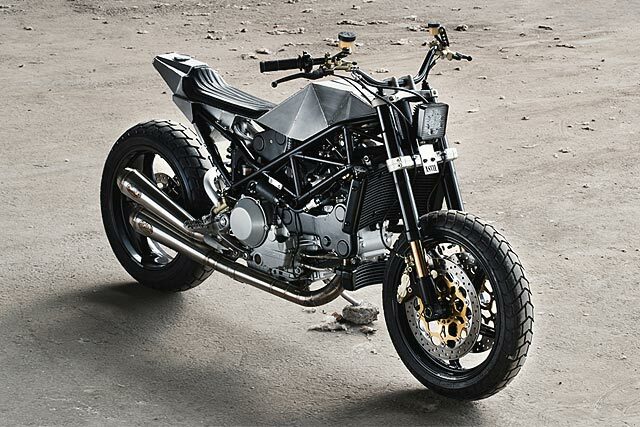 Which you’re going to need when you remember that the S4R is no ordinary Monster with a two valve air-cooled engine. Taken straight from the 996, the four valve engine uses 20 years of R&D to pack the ultimate superbike punch into this weapon for the street. 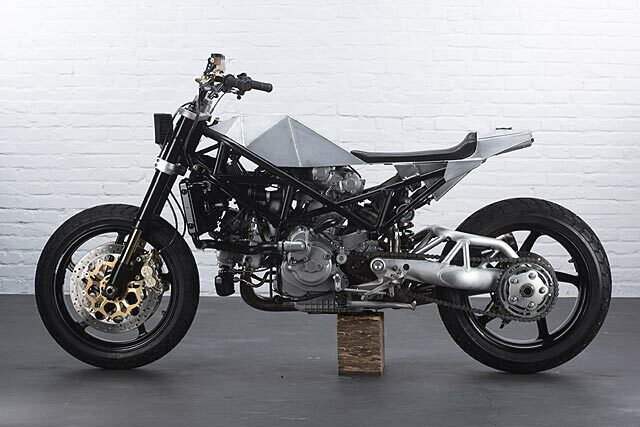 But Anvil wasn’t satisfied with what the Ducati engineers had delivered and as well as giving the motor a visual makeover they also sought out more ponies. Zard came back to the table with one of their incredible exhaust designs and the expanded airbox design feeds all new filters. With the hardware in place the Marelli EFI has been remapped to suit and you have genuine 280km/h potential. That takes some serious steering so rather than fit clip-on bars and swanky pieces San Marco and Phonz wanted to give their customer maximum control. 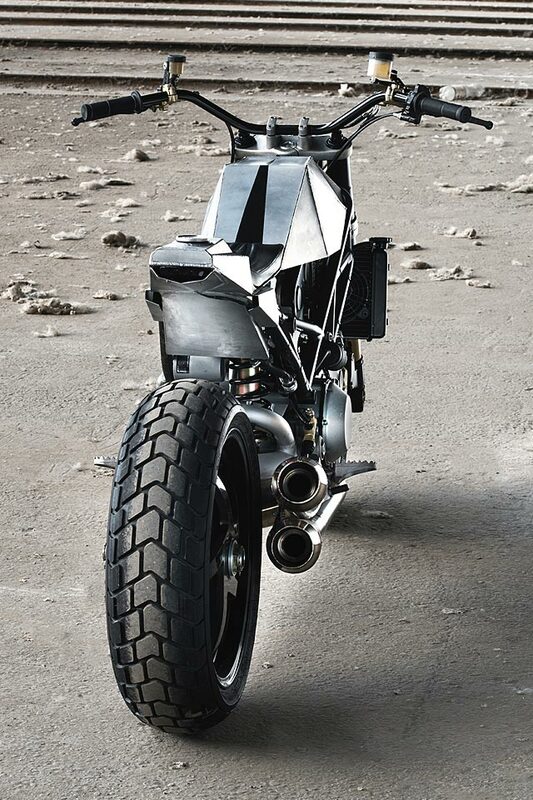 This is achieved with “wide handlebars as if it were two devil horns, because of the devil it is, the result we wanted to create on the WARTHOG is a super naked exasperated both in cycling and in performance,” enthuse the boys. 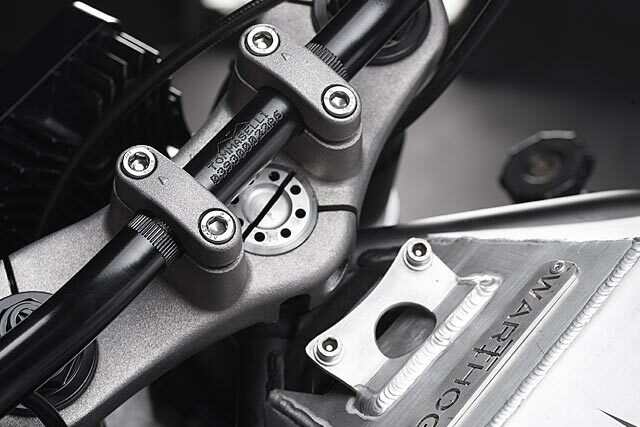 The black bars are from the Tomaselli catalogue and have been fitted only with the bare essentials, levers and reservoirs from the Brembo catalogue. Bear trap pegs make sure the rider’s feet stay where they’re meant to be and all said and done this radical ride is set to attack the streets like its name sake with devastating consequences and absolutely no victim spared.